My father lost his battle against skin cancer that had spread throughout his body one year ago. I am a Florida native who has also experienced a lifetime of sun damage and had my first (and hopefully last) skin cancer removed when I was 38 years old. I am passionate about protecting my skin and promoting skin cancer awareness so that hopefully more families will be spared the loss of a loved one to this devastating illness. One skin care product line that I have been using that delivers consistent results by using the highest quality ingredients and cutting edge technology is ZO® Medical. 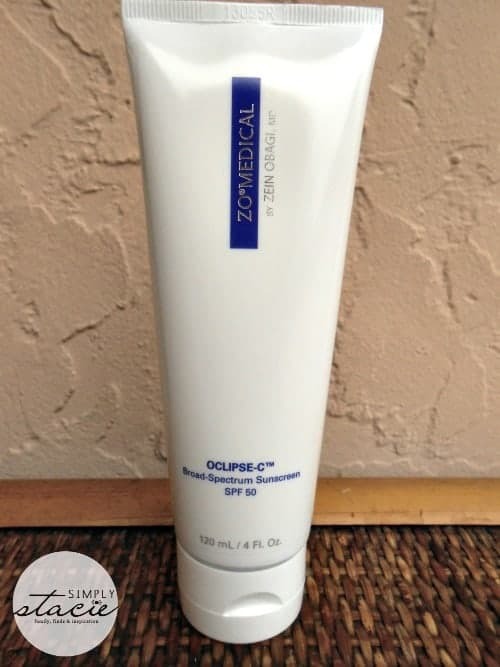 I was thrilled to try the new ZO® Medical Oclipse-C™ Broad-Spectrum Sunscreen SPF 50. I expected that I would love this product as much as I do other ZO® Medical and ZO® Skin Health products however this product is even more exceptional than I anticipated. Developed by Dr. Zein Obagi, ZO® Medical Oclipse-C™ Broad-Spectrum Sunscreen provides SPF 50 to prohibit HEV light (High Energy Blue Violet Light) absorption as well as UVA and UVB protection. Unique to other sunscreens available from other brands, this product from ZO® Medical targets the lesser known HEV lights which can cause greater long-term damage to the skin. It is formulated with lightweight minerals and enriched with fractionated melanin and antioxidants to help shield the skin from environmental stressors and sun damage. I apply a small amount of the product to my entire face, neck and any exposed areas on my chest every day in the morning after cleansing the skin. It is very light weight and feels wonderful on my skin as it absorbs effortlessly leaving behind no greasy residue. I often just apply this product to my bare skin but I also noticed when I do use make up it applies easier over this product and my skin looks fresher. I have less redness due to irritation from the sun and my skin is starting to feel a bit softer to the touch over the past 30 days. ZO® Medical is proud that Oclipse-C™ Broad-Spectrum Sunscreen has earned the esteemed Skin Cancer Foundation Seal of Approval and I will continue to use this product every day for complete broad spectrum protection from the sun and HEV light. You are invited to visit ZO® Medical to learn more about Oclipse-C™ Broad-Spectrum Sunscreen as well as the entire skin care product line. I’d also like to try their hand cream. I’d be interested in trying the Normacleanse. I’d like to try the NORMACLEANSE™. I would love to try the Cebratrol. I Have rosacea and am always looking for help. My would love to use Normacleanse. I would like to try the Hydrafirm to get rid of the puffiness under my eyes. Thanks for the chance to win. Dual-action cleanser exfoliates and cleanses skin targeting excess oil. Removes oil and other impurities to clean the skin and clear acne. BRIGHTENEX for me. Pigment! Ack!